What Makes a Hydrostatic Lawnmower Not Move? According to the experts at Today's Mower, there are fives types of drive gear in common use on lawn care machinery: gear, friction disk, automatic, CVT, and hydrostatic. Hydrostatic drives are extremely easy to use when compared to geared versions; with the latter, the operator usually has to come to a complete stop and depress a clutch to change ratios, which becomes tiresome for people using such machines professionally. Hydrostatic drives have no clutch and offer infinite speed variations. They even shift from forward to reverse with a simple change in pressure on one foot peddle. That said, there are a number of ways in which they can fail. 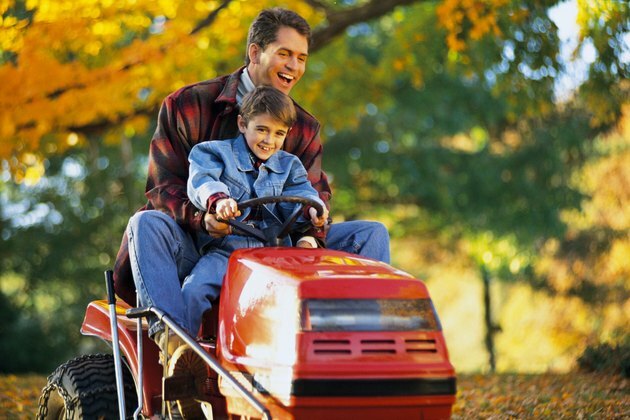 Hydrostatic transmissions are common on ride-on lawn care equipment. All five drive types have certain components in common, and the failure of any of these can result in the lawnmower not moving. Most manufacturers install a pressure-sensitive switch under the seat to interrupt the mower's self-propulsion when the seat is unoccupied; a defective switch can result in the drive not being engaged. A seized-on parking brake can either render the mower immobile or reduce its performance significantly. All drive types must be connected at some point to the motor, so there must be a cogged or splined power take-off; stripped cogs or splines will not transmit power to the drive. Hydrostatic transmissions -- often referred to simply as hydros, hydro-drives or HSTs -- are constantly variable drives similar in operation to car automatic transmissions. They have a pump that effects hydraulic fluid inside a closed system, and reduction gearing that responds to changes in that hydraulic pressure. Mechanical components also include a differential and a drive axle. Failure of any one of these components will prevent the lawnmower from moving. Hydraulic fluid is passed through either high-pressure rubber or metal hoses; a leak from the hoses or any of the other components will also stop the hydrostatic transmission from working. By far, the most common reason for hydrostatic transmission failure is old hydraulic fluid. John Deere states that "Operating outside of the recommended oil air temperature range may cause premature hydrostatic transmission failure." Oil must be changed when its anti-foam additive decays. This decay results in air and atmospheric moisture becoming blended into the oil, properly called entraining. Oil that is entrained has inferior hydraulic properties in comparison to fresh oil, resulting in less than optimal system function. Entrained oil must be drained completely. After positioning the lawnmower to drain properly -- typically this means on a perfectly flat, level surface -- remove the drain plug and allow the machine to stand for several days until every last vestige of the old oil has dripped out. Only use replacement oil of a type recommended by the mower manufacturer. John Deere advises against using red "Type F" automatic transmission fluid and bio-based oils. Most manufacturers recommend SAE 20W-50 hydraulic fluid. What Is the Difference Between Air Compressor Oil & Motor Oil? What Kind of Oil Does a Hydro Drive Simplicity Mower Take? What Kind of Transmission Oil Does the John Deere L130 Take?